Get our free SQ-X strategy examples! StrategyQuant is one of the best algo-trading/strategy development platforms available. I have decided to write an extended StrategyQuant review because more than 90% of all strategies I run on my MT4 are developed using this single tool. After many years of programming and testing for myself and also for other traders, I am 100% sure this is the proper way to go. So, what is so special about StrategyQuant? The idea is simple: StrategyQuant is based on an automatic (random or pre-configured) strategy generation using custom or standard chart indicators. For example, during configuration, when you define that you want to find and test all possible trading strategies using “Moving Average,” “RSI” and “Bollinger Bands” indicators, StrategyQuant will start generating and testing all possible combinations of all those indicators. This is just a simple example, since in the latest version (StrategyQuant X), it is also possible to add your own custom indicators and trading signals; the number of possibilities is simply unlimited. In this step strategies are generated. 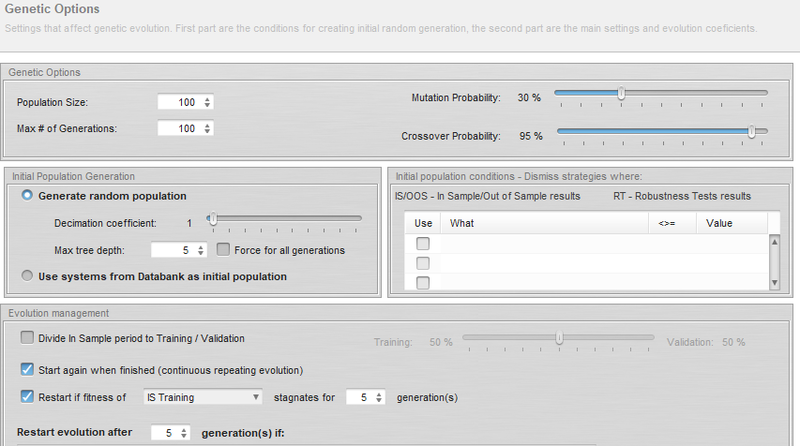 StrategyQuant has several options of trading system generation like: random or genetic. 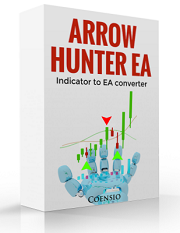 Each option can be preconfigured with manually selected indicators and price-action and/or logical operators. 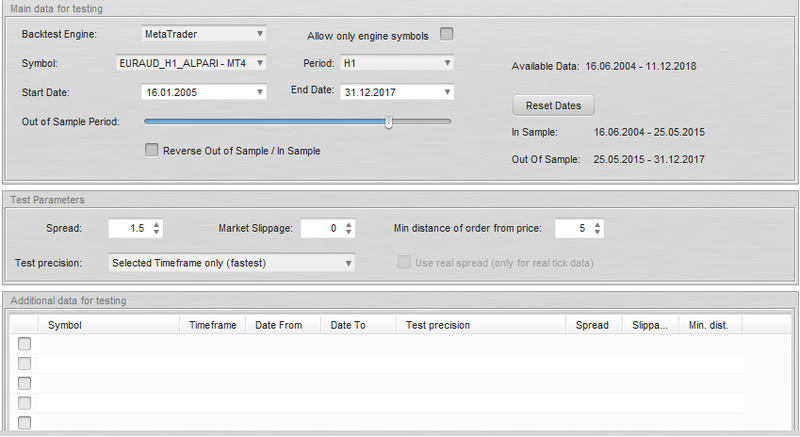 In this step users can define desired trading symbols and timeframe. The historical data can be loaded directly from a MT4/5 export or (in new SQ X) automatically downloaded from Dukascopy servers. In this design step the historical data is divided into two regions: in-sample for strategy design and out-of-sample for strategy validation on “unseen” data. But that’s not all. Users can also define their own validation pass/fail criteria, used to select only the best and most stable strategies. The most interesting criteria are: Return to DrawDown ratio and also profit-stability. For example if any generated strategy passes those two criteria it will be automatically placed in a local databank for further analysis. Moreover users can define many other validation checks to take into account only the top-best generated strategies. 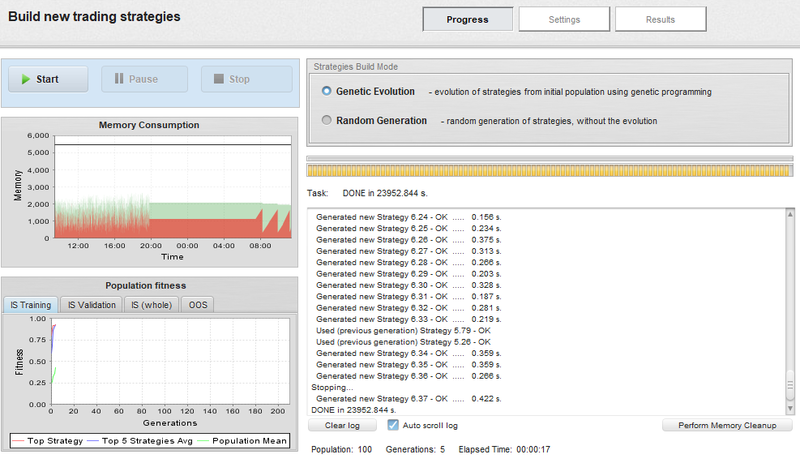 Remember that not all generated strategies will eventually be stable enough for live-testing. You need to generate at least a few hundred strategy candidates during this step. Example of poor robustness. Example of good robustness. 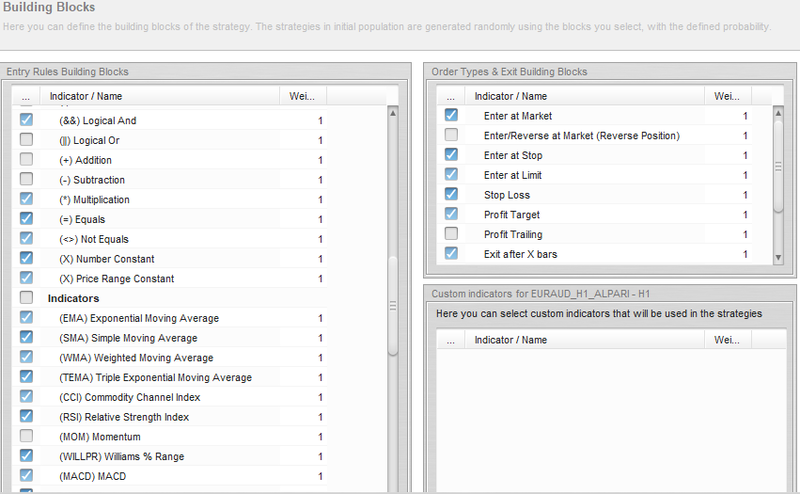 After the strategy design process the selected strategies and their corresponding settings can be exported directly as MQL source-code to an MT4 or MT5 or Ninja Trader platform. This option allows direct import of your strategy to your favorite trading platform. This step is the most important part of the whole process. Here we can find out if our strategies are making money or not. This step requires some patience and discipline but also a proper monitoring tool. 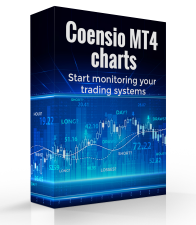 I personally use my own indicator called: CoensioMt4Charts. This tool allows you to visually monitor up to 100 different strategies on one MT4 account. You can see it in action: HERE. 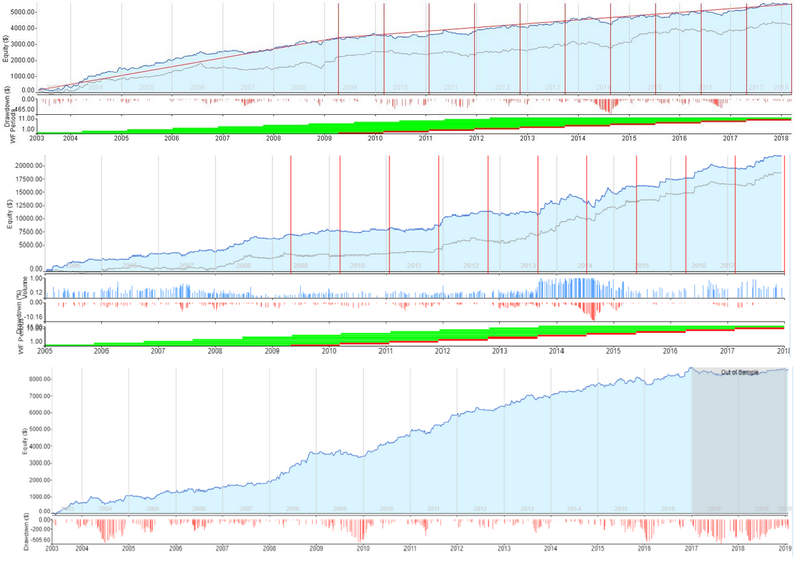 During this step we need to continuously compare our live/demo forward results with the results as seen in our backtests (in and out-of-sample period). Typically all systems will use minimal Lot size (e.g. : 0.01) or will run a a demo account, until proven to be profitable. The goal is to build a portfolio of several different strategies running on different symbols and timeframes. If we observe something unusual like a DrawDown that is significantly larger than seen during a backtest, we will shut down the corresponding system and go back to the ‘drawing board’ to see where our design process has failed us. ATTENTION: If you will use my discount coupon to purchase any version of StrategyQuant I will give you my CoensioMt4Charts for free! In this section I’ll try to ‘quickly’ demonstrate the power of StrategyQuant by showing one example of strategy design on EURUSD H1. Note that this is just a ‘top of the iceberg’ to quickly demonstrate the capabilities of the SQ platform. Before considering buying this tool you need to know one thing: finding profitable strategies is like trying to find a needle in a haystack. It takes many hours of generating, testing and validating before you will find a good robust strategy. StrategyQuant is not ‘push button and make money’ product! It is meant for professional traders, quants and for people who are really interested in algorithmic trading. That being said the following example is for EDUCATIONAL PURPOSES ONLY. The EURUSD H1 historical data comes from Alpari broker (directly exported from the MT4 history center), and the original data range is from 2004.01.01 to 2018.10.19. In order to speed up strategy generation we will only concentrate on data between 2005 to (and including) 2018. However in the first step we will split this data into two ranges: ‘in-sample’ range: 01.2005 to 02.2016 and ‘out-of-sample’ 02.2016 to 12.2017. – we will start from 2005 in order to also include the financial crisis period during 2007/2008. – we will not use 2004 and 2018 for now, this period is reserved for additional validation during the strategy retesting step. This step is done automatically during strategy generation. Each strategy that passes all defined tests during the ‘in-sample’ period is also automatically retested and validated during the ‘out-of-sample’ period. This great feature allows to pre-filter the good strategies from the bad already during the generation period. The resulting good (interesting) strategies are automatically sotred in internal databank for further analysis. During retesting we will concentrate on the following characteristics: strategy robustness, Monte-Carlo analysis of selected parameters, the resulting Return to DrawDown ratio and overall stability of equity curve rise. This is the last step in our design flow, here we need to select interesting candidates which have the best chances of making profit during the forward test period. For example the following strategy has shown stable results across all stability checks and also profitability in ‘out-of-sample’ period. Also during 2018, which has not been used for strategy generation at all. The strategy presented above is just an example of several good strategies found during this one generation run. If you consider purchasing StrategyQuant and you use my personal 20% discount, you will get all SQ settings and generated strategies from this particular example. Read more in the next section. If you have ever considered automated trading, just forget other expensive commercial EA’s and create your own profitable trading strategy! 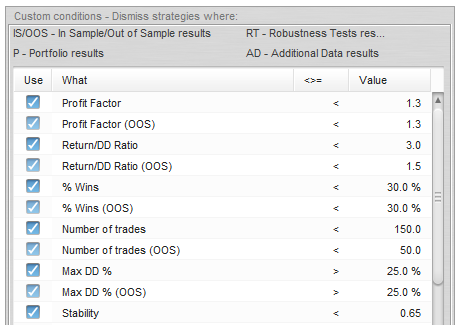 And yes, you can test StrategyQuant for free! 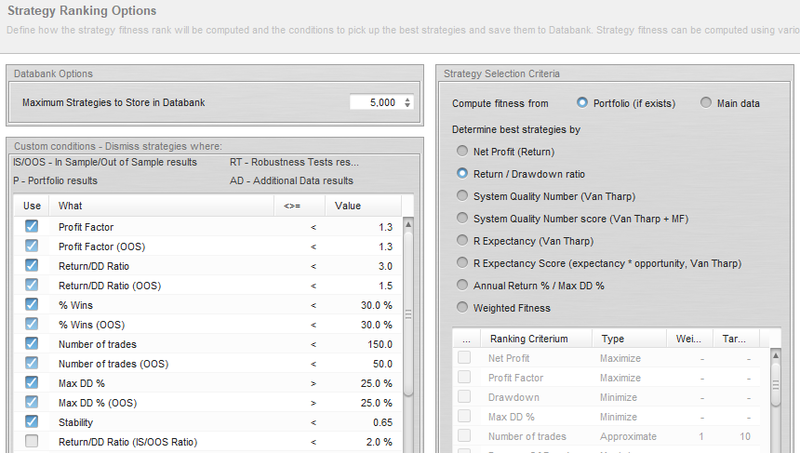 StrategyQuant V3 + new StrategyQuant X versions (standard deal). My CoensioMt4Charts indicator for results tracking and monitoring. See HERE. 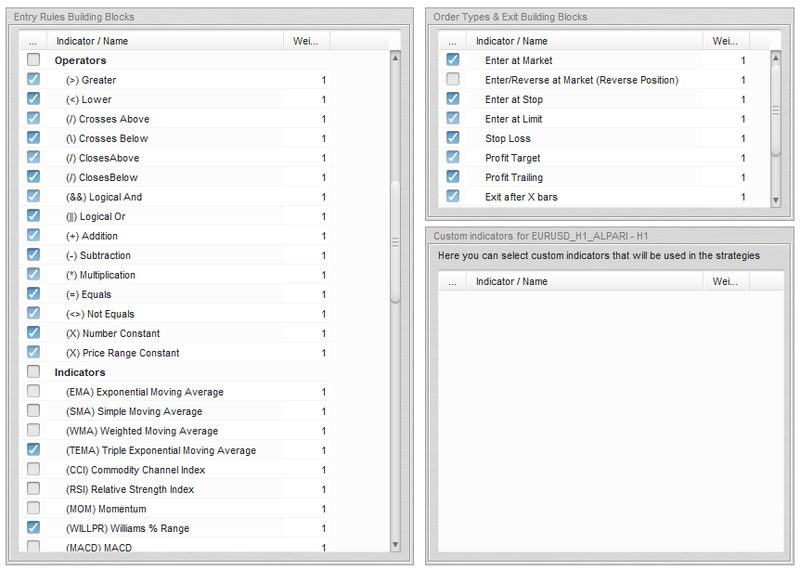 Examples of robust EURUSD H1 strategies + SQ settings, from the example above. Access to our Coensio forum, where we can exchange trading ideas and learn from each other. My personal algo-trading course (email based). See section below. Please contact me on my email. I will send you more details about the course. I have StrategyQuant software with me. How to get the course?. Thanks. Just register to the webinar, the link in on my website. I already have the Pro version. I would like information about the course. Hi. As you have been programming and trading. Have you got an EA that works well? Sure 😉 There are many things that work if you know what you are doing of course..hint: try to combine this Ea with harmonic patterns indicators, those work the best. You also need to master the process of strategy optimization, stability testing and robustness testing, but in the end it is possible to create profitable systems, but do not expect any holy grails that will make you rich overnight. I plan to buy SQ software with your code package how can I do ? Yes I also looked into FSB, indeed both look ‘similar’ but I think SQ especially the new version SQ-X has much more professional features that make life of an algo-trader much ‘easier’.